Individual or Lay Witness. 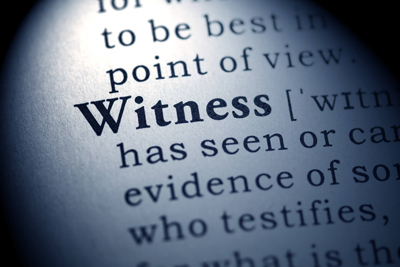 An individual or lay witness is someone who was at the scene of the accident or someone who personally knows the victim and has witnessed how the injury has affected them. This type of witness has no expertise, training or specialized knowledge associated with the claim. Expert Witness. An expert witness is someone that has expertise, training or specialized knowledge that pertains to certain aspects of the case. The accident victim in many personal injury cases is the most important witness because they were in the accident, they have sustained the injuries and know how their life has been changed. They know the pain and suffering it has caused them, the cost of the medical bills, the treatment they are undergoing, how much work they have missed and what their quality of life is since the accident. An eyewitness is someone at the scene who witnessed what occurred. If the victim has family members that live with them or are helping to take care of them after the accident they will have firsthand observations of how the injury has affected their life. Coworkers can also testify about how much work the victim has missed and if the injury has affected their ability to work or enjoy the activities they loved. The first people at the scene can testify as lay witnesses about what they saw when they arrived as well as what they heard from other eyewitnesses. First responders may also testify as expert medical witnesses. In certain situations police officers may qualify as experts regarding certain aspects of accident recreation and investigations. Medical personnel may not only testify about the victim's injuries and treatment, but may also give expert opinion testimony about the effect of the injury, the person's recovery and rehabilitation potential, as well as express their opinion about what medical treatment will be needed in the future. Manufacturing experts might testify about automotive parts or product defects that caused an injury. Experts in engineering frequently testify about how a building, construction feature, device or product was not properly designed, built or maintained. They are frequently used in vehicle or bicycle crashes, as well as in slip and fall cases. These are experts who study how vehicle or other crash or injury related incidents occurred. They visit the scene, examine the bicycle or vehicle involved, download data, review photographs, medical reports and other investigative information in order to render an opinion about how the crash or injury causing event happened. They are just as likely to be of great value where there are no eyewitnesses, or to contradict an unreliable eyewitness. They specialize in calculating future economic losses including lost wages and lost ability to work. They frequently create life care plans which project the total cost of caring for someone's needs through the remainder of their life. Not all personal injury cases require an expert witness. However, when needed, an expert witness can help explain the facts of the case, render opinions about the medical diagnosis or who is at fault in causing the injury. They are invaluable in calculating the cost of future medical care, lost earnings and earning capacity, and the anticipated costs someone will incur for medical treatment, medications and attendant care the remainder of their life. What Witnesses Should I Have for My Personal Injury Case? Your attorney must be experienced in understanding which experts may be of benefit to your case. Great care must be exercised in balancing the cost of presenting expert testimony against the value the expert may bring to your case. Your lawyer must also assess the expert's ability to be perceived by the jury as knowledgeable, believable, and credible. A good expert may add great value to your case. Attorney Jim Dodson has successfully settled all types of personal injury claims. If you’ve been injured, we encourage you to contact us online or call us directly at 888.207.0905 any time to schedule a free consultation. We will answer any questions you have and walk you through the steps of how a personal injury lawsuit works. We work hard to get you the compensation you deserve.